Lynn's journey through Hell to find her family bogs down in bureaucracy and other obstacles. Even her guide, the poet William Blake, is at times at a loss in ways to help her. It's a clever literary funhouse with some meaningful undertones. For anyone who's spent time at the DMV and considered it Hell, languishing in long lines and dealing with rude or distracted clerks, you'll recognize the Hell Lynn has to deal with when she pushes her way to the front of the line to speak to the judge, novelist Franz Kafka. She's desperate to find the location of her dearly departed family but finds little help in this congested and unforgiving dimension. The DMV only feels like eternal damnation whereas Lynn is living it unless she gets some help. 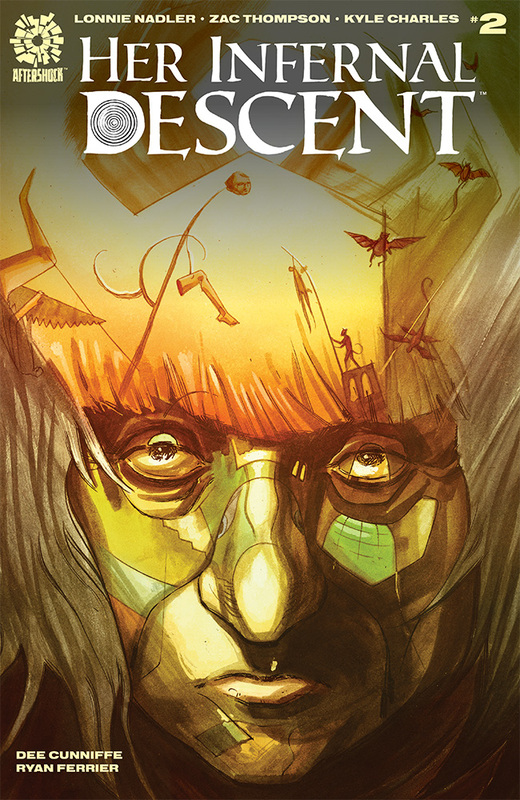 While 'Her Infernal Descent' is a riff on Dante's Inferno, this issue feels more like Lynn's descent into the rabbit hole ala 'Alice in Wonderland.' We get more of lay of the land as she traverses the landscape looking for her family. William Blake continues to guide her and his rhyme game stays strong but there's only so much he can do which drives Lynn crazy. Along with Kafka, they encounter other literary legends like Friedrich Nietzsche which leads to questions about the fate of influential literary giants. Do they all end up in Hell? The issue reads more like an exploratory exercise, like when you reach a new level in a video game and you just wander around exploring your surroundings. Lynn's frustrations lead her to some weird and metaphorical areas like the pig people of Gluttony, and the media-obsessed monitor-heads who must constantly be "guzzling." It's all a frightening fever dream culminating in a splash page of gruesome monsters. Kyle Charles is the architect of your nightmares. It's no easy task to imagine what Hell would look like but thanks to Charles' twisted imagination it's gnarly, gross, and torturous. The art transports you into this dark underworld but Lynn's determination offers a glimmer of hope. Dee Cunniffe works overtime providing a variety of colors from the reddish-brown atmosphere in the beginning until it brightens to blues, yellows, and greens. Hell has never looked so awful, in a good way. Lonnie Nadler and Zac Thompson have established a wild netherworld for Lynn to travel through. It's steeped with literary figures that inject some classic quotes and add some more strangeness. The only thing I would like to see is some flashbacks to the family she so desperately seeks. Otherwise, 'Her Infernal Descent' is a unique comic book experience that becomes more intriguing with every issue.